This chess attack strategy, chess force article is part 4 of the chess glossary at gamerisms. This article is designed for chess players who want to learn more than simply basic playing techniques. In the opening, the forces have marched up to battle array. Then, in touch with each other, they come into collision. How is the intelligent player to conduct a campaign that is approaching a crisis? His/her men, at the start so obstructed, are now free to move about. Possibilities for chess attack strategy and defense are almost unlimited. How, out of the multitude of possibilities, is the player to select the right move or, at least, a move that is good, according to his/her present level of development? His first consideration should be that his moves, to be intelligent, must involve Connection and Plan. 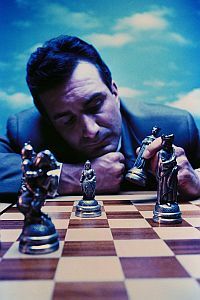 A disconnected move is one made with little thought about future moves or possible scenarios made by the opposition. It suggests as being in the nature of a trap, to the opposition, but it is a hastily made move. If the opponent is taken unawares the scheme succeeds, but should the opponent see the hastily made move for what it is, the attempt recoils on the schemer. Here then we begin to see that Force is a concept that needs to be included in any chess attack strategy. Of two players that are ready for a battle, one is entitled to gain the upper hand that has the most force behind it. This principle is fundamental. If your experience does not conform to it, not the principle but your application of it is at fault. In that case, you have to review your valuation of the forces engaged and be on guard for mistakes. If your strategy was precise, the weaker side cannot gain a lasting success. An initial success may happen-but not a lasting success. Such is the nature of force. Strange as it may seem, the human mind has taken a long time to learn how to apply the concept of force to chess. The mistake committed was to confuse chess force and effect. Force is composed of two factors, one of them being effect, the other one a thing susceptible to effect. An effect and a target combined make a chess force. As an example, a moving Queen is capable of many effects, but if the hostile men are protected even the Q is dependent upon the co-operation of other pieces in order to extend force. Thus, the position of the King is weak when aggressors find few obstructions in the K’s quarter, and a player discerns a “weak point” in the opponents camp when he sees that the opponent cannot launch a chess attack at a piece placed in that point. If that point is occupied by a man that shows strong chess force from that position in relation to his other pieces, it is said to have a “strong point.” Weakness may be moving or stationary. A concentration of effect on a weakness will pay only if that weakness is stationary, for otherwise, by moving the weakness, the concentrated affect would hit an empty spot and therefore be wasted. Stationary weaknesses are, a King who can no longer castle and is defended by relativity few pieces, or to whom access is easy; a pinned piece, a piece of little movement. For instance, one which has been shut in, or whose movement would entail heavy loss, or in a frequent case, a blocked pawn. Fleeting, or temporary weaknesses, such as a moving but unprotected man, or a piece of high value on a point easily accessible, may also be taken advantage of, but by a different process than that used to attack a weak piece due to the lack of movement. To attack a temporary weakness merely to make the power of ones pieces manifest is bad play. The chess attack strategy is useful only when with the same move or some other advantage is gained. For instance, when a chess attack on several moving weaknesses is simultaneously done. The defender then has the hard task of escaping from several perils, and has only one move to do this. A task solvable only by counter chess attack against some momentary weakness of his attacker. Chess Attack Strategy: The rule that implies this is simple. When the pieces captured on a point represent higher value than the pieces lost in the struggle on that point, the attacker achieves an advantage on that point. Most often the number of pieces captured shows how much of an advantage the chess attacker has achieved, but not always. If the King is checkmated the attacker may sacrifice any number of pieces to achieve that outcome, and still end up ahead. And a Queen and sometimes a Rook are of so high a value that capturing them is sufficient compensation for the loss of several men. If the pieces involved in the chess attack and defense are of equal value, the player must count the number of threats directed against a point, in order to decide whether the chess attack against the upper point has succeeded in gaining the upper hand or not. Even if the chess attack strategy achieves a worthwhile advantage, it may not be the best strategy to make the attack immediately. The attacker may bring additional force to bear on the stationary weakness and end up with an advantage as well, but he must not strike while he maintains this advantage. And he must consider whether the reserve force that he can use against the weakness is as great as or greater than the reserve force that the defender can bring up in the same time. The conception of value is bound up with that force, which again implies effect and weakness. You may change the rules of chess, enlarge the board, increase the number of men, vary their degree of movement, do all this to any extent and yet the above reasoning will apply. This concept shows that we have something that is useful beyond the narrow limits of chess. Since absolute perfection does not exist, this method can be executed only with the ideal perfect master rather than a strong player. The judgment of the master has authority. The written and printed word of the master should be consulted. Thus, our own advancement can be helped by taking advice from masters. But we should not wholly rely on advice and examples and need to develop our own style from practice. If we abandon our judgment in favor of authority then we cease to have original thought. In that case, the student is bound to make mistakes, because he needs judgment to understand the master. If on the other hand, he stubbornly maintains his right to use his own judgment, he keeps the springs of his creative thoughts alive and is one of the few that can bring innovation to the game of chess. Chess Attack Strategy is part 4 of 6 of the Chess Glossary + Checkers.